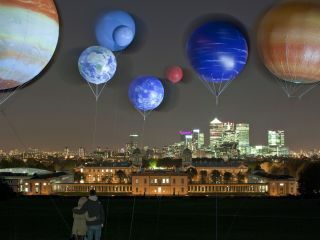 Sky has celebrated the arrival of more content for its Sky 3D channel with helium filled representations of our nearest planets and floating them above London's Greenwich Observatory. The stunt was brought about by the arrival of The Universe: 7 Wonders of the SolarSystem, a 3D documentary that will make its bow on Sky 3D soon. Nine helium balloons styled up as planets from our solar system were floated and illuminated to create a 'unique spectacle'. The documentary will air on Sunday 24 October – and if you can bear the odd over-enthusiastic American scientist is well worth a watch for some cool 3D effects. "The phenomenal universe we live in has captured the imagination of generations for centuries and we wanted to add yet another dimension," said John Cassy, Sky 3D's Channel Director. "It's taken a team of 17 people over 100 hours to recreate the Solar System over the London skyline, with the impressive Jupiter dominating this celebration of The Universe on Sky 3D." The Sky 3D channel is available at no extra cost to Sky's top-level package subscribers, and showcases sport, arts and 3D movies.